Em hotep nefer, Temple-family and friends! With our Fundraising Bak A'Aqytsekhmet's blessing, I am offering my modest artistic services to help raise sorely-needed funds for the House of Netjer. For a $15 donation directly to the House of Netjer, I will create a custom coloring sheet, made available as a digital download, featuring the Netjer(et) of the donor's choice. For a $25 donation to the House of Netjer, I will include YOUR name (whether it's your Shemsu name or a name you prefer to go by in your daily life) in a Middle Egyptian benediction or hymn to the Netjer(et) of your choice in an original artwork -- basically, a 2D devotional stele! (I am only proficient in Middle Egyptian hieroglyphs; I am not proficient in Hieratic or in Demotic). All you have to do to be eligible for a custom design is email me proof of donation in the form of a forwarded confirmation email or screencap to sedjfai(at)gmail(dot)com, along with which Netjer(et) you want me to create an image of. If the "donation" bar and button don't appear for you on the forum, you can begin the donation process here. Feel free to include reference images from sculptures, temple reliefs, etc. in your email to me, along with any descriptions of details you would like me to include -- the Netjeru each have a variety of forms, after all, and I need to know which form of which Netjer(et) you want depicted! Each image will be in a traditional Egyptian style, unless otherwise indicated. I can also make images in a semi-realistic style. Click here to see an example of traditionally-styled image I have made, and here for an example of a semi-realistically-styled image I've been working on. I will release rights to the images to their respective donors. That means you are free to do with those images what YOU wish, since you will have effectively "bought" them, whether it's for a tattoo design or something you would like to incorporate into your own artwork. PLEASE SPECIFY WHETHER YOU WOULD LIKE YOUR COLORING SHEET TO BE MADE PUBLICLY AVAILABLE / FREE TO DOWNLOAD WITHOUT A WATERMARK FOR OTHERS. You are not obligated to make it public, or to keep it private; I leave that decision entirely to the discretion of you, the donor. Each coloring sheet will note who sponsored it with their donation, along with my signature and the year. A watermarked copy will be uploaded to my DeviantArt page, for the sake of my maintaining a digital portfolio. All of these pieces will be hand-drawn and hand-inked, by me. These are not digital artworks. It will take me anywhere from four to eight days (rough estimate) to complete each, depending entirely upon the intricacy of the design, and they will be completed in the order received, so please be patient. There are five slots available for the $15 tier, and five slots available for the $25 tier. Get 'em while they're hot! Wow!!!!! What a generous offer!!!! This is an amazing offering! If any are left on payday you can bet I'll be here. As of this moment, there are 5 of the $15 tier slots and 4 of the $25 tier slots still available. Dua Netjer enten for doing this Sedjfai! I'm commenting again to note that the second $25 tier slot has been snagged by QenenetSerqet, for Her Mother Aset-Serqet. Nekhtet and thank you! Three $25 tier slots are still available, and all five $15 tier slots are still available. Raising this thread from the dead. I have been posting otherwise, clearly, but I have been going through a personal set of hells at home over the last month and change that have really, really interfered with my ability to make halfway-decent art. My sincerest apologies to Rev. Ibi and QenenetSerqet for the excessively long wait. I just finished Rev. Ibi's commission this morning, which can be viewed/downloaded here. I'm now crunching on Qenenet's commission, which I hope to have completed in a few more days. 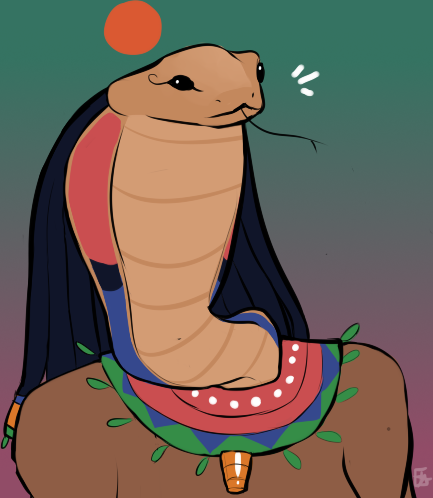 Because I am doing the second place prize artwork (of Ptah!!!) for the Gods upon the Year Fundraising Drive, I won't be taking on any additional donation-commissions for now. I hope my personal situation will normalize by October, and that I can reasonably take on additional donation-commissions again by then. Again, my sincerest apologies to anyone I have disappointed over the last month+. The events which have occurred were unforeseen, but that said, it's no excuse for me to have gotten so off-track. You have not disappointed me at all. We have corresponded and I completely understand. You are in my prayers, hon. Much love. I hope I am able to snag a spot my money comes in monday! Unfortunately, the situation has not changed since my last post. After dealing with a number of family-related crises unfolding in succession over the last several months, and after going through a number of embarrassingly-failed attempts on both the Ptah piece for the "Gods Upon the Year" fundraiser (which I am only NOW just making satisfactory progress on, on the fourth or fifth committed attempt) and on Qenenet's woefully-overdue Aset-Serqet piece . . . and all in the midst of YET MORE ongoing projects that have been in various states of "unfinished" for months . . . I'm not taking on any new art commissions on until further notice. Sorry. I'll be sure to make a separate thread about donation-commissions once the situation changes for the better and remains that way for an encouraging amount of time. Lately, I've been trying to make wine out of vinegar, in a manner of speaking. I appreciate your patience and understanding in my playing artistic-catch-up while running on a whole lot of . . . the wrong stuff for the tasks long at hand.